Three foot gauge railways have a track gauge of 3 ft (914 mm) or 1 yard. 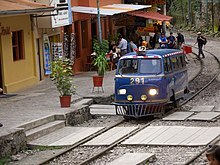 This gauge is a narrow gauge and is generally found throughout North, Central, and South America. In Ireland, many secondary and industrial lines were built to 3 ft gauge, and it is the dominant gauge on the Isle of Man, where it is known as the Manx Standard Gauge. 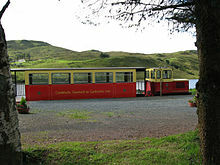 Modern 3 ft gauge railways are most commonly found in isolated mountainous areas, on small islands, or in large-scale amusement parks and theme parks (see table below). This gauge is also popular in model railroading (particularly in G scale), and model prototypes of these railways have been made by several model train brands around the world, such as Accucraft Trains (US), Aristo-Craft Trains (US), Bachmann Industries (Hong Kong), Delton Locomotive Works (US), LGB (Germany), and PIKO (Germany). The Ferrocarril de Sóller and the Tranvía de Sóller are located on Majorca in the Balearic Islands. The other railways of the Majorca rail network were also 3 ft (914 mm) gauge, but with expansion and reconstruction of the network in the early 2000s, they were converted to 1,000 mm (3 ft 3 3⁄8 in) metre gauge. ^ "Al Zawra'a Dream Park - official website (in Arabic)". Archived from the original on 2014-02-05. Retrieved 2014-01-25.